JG Speedfit are excited to officially announce their latest national promotion – ‘Every Metre Counts 2015’. 2014 proved a very successful year for the JG Layflat® pipe competition, with a lucky plumber winning the brand new Ford Transit Connect Van last October. JG Speedfit will once again give installers the chance to win big with JG Layflat® pipe in 2015. This year’s competition will celebrate the fact that JG Speedfit are the official title sponsor of the GBmoto Kawasaki team competing in the 2015 MCE British Superbike Championships. The team will compete under the name of JG Speedfit Kawasaki, making it no surprise that the big prize for this year’s JG Layflat® promotion is a Kawasaki ZX-10R motorcycle. 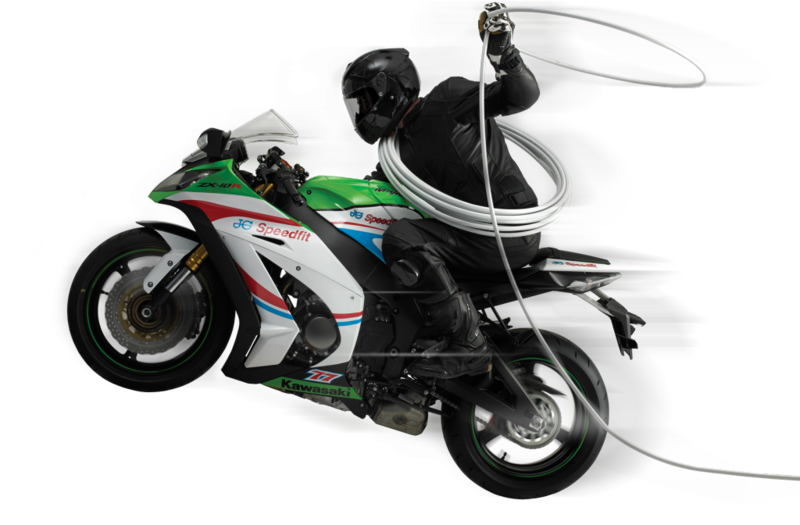 By purchasing any coil of JG Layflat® pipe you have the opportunity to win the brand new Kawasaki ZX-10R bike. To enter the competition all you need to do is fill in your contact details on the back of the card found in each JG Layflat® coil and send it back to JG Speedfit. Alternatively, you can register for the prize draw online at the dedicated Layflat competition page on the company website – www.speedfit.co.uk. When registering for the competition online, don’t forget to enter the unique code found on the back of the card. The bike will be a road going version of the JG Speedfit Kawasaki competing in the BSB Championships, which makes the prize even more exciting. The lucky winner of the bike will be announced on 12th October 2015. However on 12th June an additional prize draw will give away a weekend break for two to attend the BSB race event – taking place in Assen, Holland, 19-20 September 2015. The package will include flights, hotel accommodation and VIP hospitality. Promotion runs 1st April – 30th September.